Happy New Year – 2018 – A Sequel is Coming! What’s Up the Road in 2018? A Sequel! TESTAMENT – An Unexpected Return, arrives in March. The sequel picks up the story at the beginning of the following July. There’s a noticeable change in Pete’s and Harold’s characters. Mary’s got a life-altering decision to make. Liddy weighs a position that will get her out of the house. The Archer family face more challenges as events unfold. Wedding bells ring while more than one unexpected return keeps you turning page after page. All the while, foreboding, ominous storms from Shiloh’s past rattle its present and reshape its future. May God grant you and yours a safe and prosperous 2018! Posted on December 27, 2017 December 27, 2017 Categories Shiloh Saga: SanctuaryTags amazon, books, Christmas, Coach, family, fiction, Holidays, mystery, reading, sanctuary, sequel, Shiloh, southern, southern fiction, suspense, Testament, thrillerLeave a comment on Happy New Year – 2018 – A Sequel is Coming! Shiloh’s Original Stately Courthouse replaced by a more modern City Hall building. Enjoy this short sneak-peek into Sanctuary’s story, then click on the video links on the side panel to learn even more. After [enjoying our first meal in Shiloh], we decided to stretch our legs and venture into the center of town. On the town square, Liddy found a bench next to the walkway and admired the unique architecture of Shiloh Baptist Church across the street. My interest fell upon the bronze statue we saw earlier. JESSIE MASTERSON, BELOVED COACH AND TEACHER, SACRIFICED HIS LIFE SAVING THE LIVES OF TWO OTHERS THE NIGHT THE ORIGINAL COURTHOUSE BURNED DOWN, DECEMBER 8, 2010. I stood with my arms crossed while my instincts conjured the possible story behind those two dozen words. “Southern Writers Magazine “Must Read” in their May/June 2017 issue. HOW CAN YOU GET YOUR COPY OF SANCTUARY? Also stop by TM Brown author page on Facebook for his latest reviews and schedule of book events. I also encourage you to support your local independent bookstore. They will gladly order your copy of Sanctuary, if they don’t already have it on their shelf. “Christmas in Shiloh” with Santa and the full moon is a promottional image. “Christmas in Shiloh” is the backstory timeline in Sanctuary. In every small, time-lost town in the South Christmas is a magical time to look forward to. With Sanctuary’s all-audience reviews, it’ll make the perfect holiday gift list for your book-loving friends, family, or co-workers. Please leave or comment or question. I would enjoy hearing from you. More sneak-peek scenes coming in the coming weeks. Though a contemporary mystery, its colorful characters are timeless and reflect values and traditions governed by their reluctance toward change. Come join Theo and Liddy Phillips as their story unfolds after they arrive in lil’ ol’ Shiloh expecting a peaceful retirement in a town much like they grew up in decades beforehand, only to discover Theo’s curiosity about a tragic event does not receive a warm and welcome response by everyone in their new rustic town. Click the image below and visit Amazon to purchase your copy of Sanctuary. Available in paperback or Kindle editions. Would love to hear from you. Please leave a comment or question. Until December 31st, I will be collecting the names of the reviewers of Sanctuary, and twenty-five will be chosen to receive advance reader copies of Testament, the sequel, due out early 2018. Sanctuary covers a specific timeline as Theo and Liddy’s story unfolds in the late Fall and ends on Christmas Eve in Shiloh. This makes this heartwarming small-town Southern mystery a wonderful holiday gift for family and friends. Nothing changes about the original book cover, however the promo images infuse the “Christmas in Shiloh” imagery. As a proud author-member of Southern Independent Booksellers Alliance (SIBA), I personally encourage you to contact your local independent bookstore to purchase your copy of Sanctuary. You can also visit my Facebook author @TMBrownauthor and follow the links to order your Kindle or paperback at Amazon. Or go directly to Amazon’s Sanctuary page. REMEMBER: There are two current noteworthy promotions underway. (1) From all the reviewers of Sanctuary, twenty-five will be selected after December 31st to receive advance copies of Testament, the sequel due to release early 2018. (2) On a first come first serve basis, there are four (4) Kindle versions of Sanctuary available. Just go to my Facebook Author Page and comment why you love Southern mysteries or what you find intriguing about Sanctuary. Remember this is a limited offer so don’t hesitate to respond. For schedule of all my author events in the coming weeks please go to my Facebook author page. As the holidays approach, do you think Sanctuary might make a convenient holiday gift for your book loving friends and family members on your Christmas list. Email me at tmcabrown@gmail.com. I’d love to hear back from you. Thanks to the hundreds who have already invested Sanctuary so far! Sanctuary: A Holidays Gotcha Mystery! Sanctuary – a Holidays Gotcha Mystery! Within this novel suited for the holidays you will meet some very unique and interesting people that live in the small town of Shiloh as they look forward to celebrating “Christmas in Shiloh”, a normally special time in this time-lost community. A serious fire that caused a well-known landmark to burn down in this town took the life of Jessie Masterson before his time. Although he saved many from the same fate, no one could save him. But there is much more. John Priestly, the well-respected head coach of the football team – a team that rose to fame and glory under his and Jessie’s leadership. Both men were respected and revered by so many of the young adults, teens and others as they created not only harmony among team members but within the community too. Establishing a place called Sanctuary where young people and anyone else could come to talk, listen, understand and worship in a different way helped foster friendships that can never be severed. Your sanctuary can be a sacred part of a religious building as in a Christian church in which the altar is placed. It is sometimes a consecrated place or the room in which general worship is held. In this book you might say it is more of a place of protection, refuge, understanding, hope and tolerance where everyone could meet, listen, talk and find solace in their own way. But, let’s back up for a minute and meet Theo and Liddy Phillips who moved to the South Georgia town of Shiloh were welcomed and greeted upon arriving by a group of congenial and wonderful people who opened their arms and doors to them. A town that appears to be friendly and warm, yet as you gather round the many dinner, lunch and outdoor events you will learn something lurks beneath some of their congenial smiles. Theo, formerly the chief editor of a publishing company, may have retred but of course does not want his journalistic instincts to get stale or rusty. Meeting the owners of the only newspaper in town, Larry and Martha are thrilled that he agrees to do a special, investigative feature story on the life of two members of the community: Jessie Masterson who lost his life in the fire and John Priestly who is sitting in prison for supposedly embezzling school funds. Living in the home previously owned by Betty Masterson, John’s mother who passed not long after John was convicted, and taking this part-time assignment with the paper, he falls into an interesting daily rhythm as Liddy, Theo’s wife joins in many activities with the Pastor’s wife, Martha, and other prominent women in this small town, which happens to be in the midst of preparing for their annual Christmas in Shiloh event. Theo dives into the archives of the newspaper with the help of the publisher’s daughter, and he realizes that there is much more to this mystery and the cause of the fire. When he questions the young people in the town, the Mayor, the Pastor, Larry the owner of the paper and others he learns that there is some doubt of John’s guilt, and that John refused to defend himself in court. Eventually everyone will learn why. Harold Archer is the Mayor and his oldest son is Hank whose wife works for Harold at City Hall. Everyone warns Theo of Hank’s volatile personality and advises him never to deal with him alone. What I really enjoyed reading about were the interactions between Theo and the younger people that are so polite, job oriented and have their own roots within this small town and how they interacted with Theo and the respect shown to him and Liddy is heartwarming and encouraging. I think that young adults, teens and younger children can learn some real lessons in manners, morals and family traditions and dedication. Harold Archer’s family owns the construction company in town and profited from some of the projects by over 12 million dollars due to extras and add-ons. When John Priestly challenged the quality and rising costs of the construction work hard feelings festered. Theo visits John in prison, thanks to Joe Arians, John’s lawyer and new friend of Theo and Liddy, hopeful John will shed some light on why he did not fight the charges in court. This is a town where nearly everyone opened their arms and hearts to Theo and Liddy, cusing you to wonder if God did not send them there to reunite the town and rid it of its sorrows and secrets. Author T. M. Brown brings us inside a town filled with love, warmth and most of all heartfelt love for each other. So many lessons for young people to learn about respect, understanding, family values and most of all faith and forgiveness. To order your copy, visit your local independent book retailer, Amazon or request a signed copy directly at @TMBrownauthor. Posted on August 4, 2017 Categories Shiloh Saga: SanctuaryTags books, Christmas, fiction, gift, greed, Holidays, mystery, reading, sanctuary, Shiloh, southern fiction, suspense, TestamentLeave a comment on Sanctuary: A Holidays Gotcha Mystery! Is Sanctuary the right Southern mystery for you? Sometimes a short video clip says much more than a wordy response. Click on the image above to view a brief clip of a prelaunch interview conducted prior to Sanctuary’s April launch date. Then head over to Amazon to checkout the recent reviews and then order either the paperback or ebook version. Have you added Sanctuary to your ‘Must Read’ Summer list of books? Would you be interested in receiving a free advance copy of Testament, the sequel due out early 2018? Send an email or leave a comment and I’ll get back to you. When the author used the descriptor, ‘a couple of southern minutes’, I knew I was in for a treat as main characters Theo Phillips and his wife Liddy started retirement in their new hometown of Shiloh, Georgia. Thank-you for this inspiring, funny and heart-warming journey with Theo and Liddy as they accept the challenge presented them and become part of the town of Shiloh. Here’s a mystery almost all of us can dig our teeth into, especially those born and bred in Small Southern Town, USA. Well, as those good-ol’-boys like to say, pull up a chair and settle back for the type of old-fashioned whodunit that kept the Andy Griffin Show community spellbound for years. And while you’re at it, give ol’ T.M. Brown a well-deserved round of applause for giving the literary world a rousing mystery suitable for all audiences. You can check all the other reviews on Amazon, Goodreads or visit T. M. Brown’s Facebook Author Page. While visiting take a moment to hit the “liked” button to stay informed about news on the sequel’s release and author events and specials. Summer is upon us…What will you be reading? Whether you prefer reading the Kindle version or the paperback, Sanctuary will draw you into time-lost Shiloh. you’ll mosey alongside newcomers Theo and Liddy Phillips seeking to quietly retire near their country roots. But, God has other plans! Before they can kick back and relax on their porch, happenstance becomes God’s harbinger of past secrets, impacting their plans through unexpected providential encounters. discover for yourself why Sanctuary has become a must read for “all audiences” this summer. Visit T. M. Brown’s Author Facebook Page. check out the latest reviews and purchase a copy for your upcoming summer vacation. quick links help you order your Kindle (free to Kindle Unlimited Subscribers) or the paperback versions. make sure to “like” the page before you leave! For a limited time, why not request a personalized copy shipped postage-free to you. Email “Mike” at tmcabrown@gmail.com to request your signed copy – $18.95 delivered to your mailbox. NOTE: Special Book Club offer available for orders of 6+ books. Email for details. Reading and roasting on the beach go hand-in-hand. What will you be reading? Posted on June 7, 2017 June 7, 2017 Categories Shiloh Saga: SanctuaryTags books, Choices, crossroads, death, faith, fiction, god, happenstance, mystery, peace, providence, reading, sanctuary, scandal, secrets, Shiloh, small town, south georgia, southern fiction, summer, suspense, time-lost, vacationLeave a comment on Summer is upon us…What will you be reading? Have You Seen the Latest Reviews? Have you grabbed your copy? Available in more and more retail locations. From Tim Riordan pastor at Sonrise Baptist Church in Newnan, GA.
Every town has its secrets, and Shiloh is no exception. When Theo Phillips decided to finally retire from the publishing business, he and his wife, Liddy, moved to South Georgia to what they thought would be a sleepy little town: Shiloh. It was probably both the empty charming home that they purchased and remodeled and Theo’s part-time job at the local newspaper that got the couple involved in the mystery of the courthouse fire. 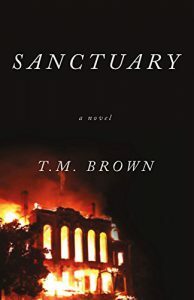 You’ll enjoy experiencing the life of a southern town and getting to know all of the interesting people of Shiloh through T. M. Brown’s novel, “Sanctuary.” I enjoyed the story and found myself being drawn into the drama. Brown does a great job presenting his believable characters and helping the reader to experience the flowing story of mystery, struggle, hope, and healing. From Randy Gravitt, InteGREAT Leadership. “Sanctuary” by T.M Brown is one of the best Christian mystery novels I have read in a very long time. There is significance in the name of the little southern town where retired Theo and Liddy Philips move to – Shiloh. The reader very quickly senses that the Philips’ have moved to the most perfect small town U.S.A. but there is a realization that things are not as they seem. The seemingly perfect little town of Shiloh and its residents are in dire need of redemption and forgiveness and Theo and Liddy are the perfect couple to put things in motion. T.M. Brown takes his time unraveling the complicated storyline and developing the wonderfully memorable characters. Probably my only complaint about this novel is that there are just too many characters. I had trouble keeping them all straight at times. Visit my Amazon Author Page to discover other great reviews and then select either the eBook (Kindle) or paperback copy to suit your reading pleasure. My best reviews are from people just like you! Visit your local independent bookstore and ask for your copy of Sanctuary? Then, contact me with your own review that you’d be willing to share with friends and family members. A gripping Southern Mystery for all audiences! Posted on May 18, 2017 May 18, 2017 Categories Shiloh Saga: SanctuaryTags books, fiction, mystery, novel, reading, Reviews, sanctuary, southern fiction, suspenseLeave a comment on Have You Seen the Latest Reviews? What Book Will You Bring on Vacation With You? Is reading and roasting on the beach p.art of your vacation plans this summer? Have you ordered your upcoming vacation novel? Check out all the rave reviews and you’ll be enticed to get your paperback or ebook copy of Sanctuary. Available online at Amazon or Barnes and Noble, and wherever books are sold! Please support your local independent bookstore. They’re the gatekeepers for the best of the latest releases because they care the most about you, their customers. Sanctuary introduces newly retired publishing executive, Theo Phillips, and his wife, Liddy, to the time-lost South Georgia town of Shiloh. They leave the shadows of Atlanta and move into a quaint home of notoriety. While making new friends, they discover twenty-first-century challenges threaten the town’s laid-back lifestyle. Theo’s interest in a memorial launches him into investigating tragic events that have left Shiloh unsettled. Theo and Liddy’s retirement dreams take a turn that could unravel both them and the idyllic life they and many others look for in Shiloh. Theo and Liddy Phillips are newcomers to the nostalgic small town of Shiloh. Met with honest, relaxed warmth by most, this newly retired couple have arrived at just the right time. Mystery shrouds the town as the truth about a tragic fire sent a beloved coach to his death, and unsettled many. The strands of truth beg to be unraveled by Theo, a former journalist, and as he and his wife settle in, the story unwraps itself like a gift into their welcoming and compassionate lives. Idyllic small town life and a bevy of believable and lovable characters left me wanting more as I finished the last chapter. Reading Sanctuary is like coming home to well-worn slippers and comfortable friends. A fantastic first novel by author and life coach TM Brown. I’m ready for the sequel. More reviews available on Amazon, GoodReads, and Barnes & Noble. Posted on May 16, 2017 May 18, 2017 Categories Shiloh Saga: SanctuaryTags books, fiction, mystery, read, reading, sanctuary, southern fiction, suspense, vacation1 Comment on What Book Will You Bring on Vacation With You? Ignorance cannot win the mind of an avid reader. Genuine Sanctuary is found when we teach our children and grandchildren the love of reading. A thirst for books sharpens the sword that will serve them well in the battle against ignorance and dependence upon others to shape their beliefs. Sign up for updates here or go to https://www.facebook.com/TMBrownauthor/ for list of local book events scheduled throughout the state of Georgia in the coming weeks. Also have virtual interviews forthcoming and book club offerings. Premier novel in the Shiloh Saga series of stories, April 4, 2017. Advance orders available.